Outside of China, bitterness doesn’t represent hardship – it is the hardship. There’s bitterness and bitterness, of course, but fundamentally, I disagree; bitterness is an easily learned delight. That’s not the point of Angie Lee’s fascinating essay Going going gan in the Cleaver Quarterly. It is about bitterness, of course, but also about growing up Chinese in America and about the elusive quality of gan, bitterness that is more than a mere taste. I’ll leave you to savour the whole thing, but one of the lessons I took away from it is that I have probably been doing pu’er tea all wrong. 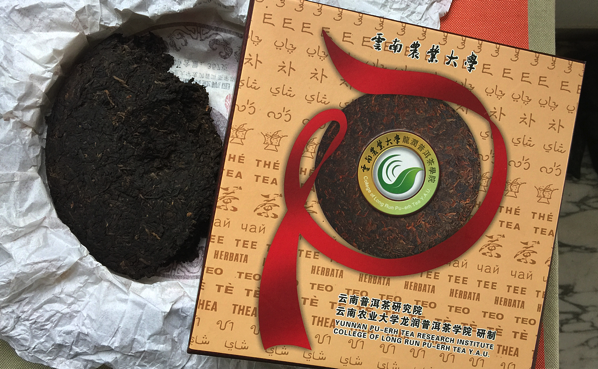 In 2005, on a visit to Kunming, I was given a huge block of pu’er tea. A dozen years later, I still have masses left. The fact is, I know almost nothing about teas. I know enough to enjoy them, but I’m no connoisseur. I go through phases, too, drinking a meditative pot of something at the close of the afternoon for a few weeks, then giving it up. The something is usually pu’er or genmaicha and, probably because I have never had a tutored tasting, I’ve never experienced anything like the sensations Angie Lee gets when she drinks pu’er. I shall continue to drink it, of course, but going forward I don’t suppose I’ll ever think of it in quite the same way. Have you been taught to appreciate tea, or anything else? I’d love to hear about it. After tea, coffee’s hot number. Why is the number 5282 closely identified with coffee? A clue: it’s all to do with phone numbers. And vanity. And biopiracy. Let’s not forget Thomas Alva Edison. And the potential of an outbreak of measles to disrupt communications. All unravelled at Peter Giuliani’s Pax Coffea. A book review to chew on Books about food and cooking remain a bright spot in publishing, with the result that, for me at least, they’ve becoming a bit like cooking shows on TV; something to absorb, passively, rather than something to motivate action in the kitchen. I was very pleased, then, to read Cynthia Bertelsen’s review of Samin Nosrat’s Salt Fat Acid Heat. I’ve seen a couple of others, of course, but this review actually made me want to buy the book. I know that’s not supposed to be the point of reviews (or is it? ), but it is as good a reason to read them as any. In the full-length Eat This Newsletter — find it online and subscribe there or here — the hummus crisis that isn’t and the beef-buying public. Dana Prescott liked this article on facebook.com. Here and now: prized tea, coffee's number and a book review to chew on. Plus the hummus crisis that isn't and the beef-buying public.